“The Life of St. Anthony,” written by Athanasius the Great, tells us that in 271 AD, e. still young Antony retired to the desert to live an ascetic. He lived for 105 years. Yakov Varaginsky’s Golden Legend, which was very common in the Middle Ages, spoke in great detail about two variants of the temptation of a saint – on land and in water. In 1478 the Netherlands edition of the “Golden Legend” was published, which influenced the depiction of this theme by artists of Northern Europe. On the board of Madrid, Bosch depicted the “earthly” temptation of Saint Anthony, when the devil, while distracting him from meditation, tempted with earthly blessings. At the end of his creative career Bosch creates several versions of the “Temptations of St. Anthony.” The Louvre contains several preparatory drawings for both known and unknown compositions. Anthony for evil spirits is out of reach. His round back, the pose closed by the fingers “locked” in the lock, speaks of the extreme degree of immersion in meditation. A person who has no idea about medieval Christian mysticism, asceticism, renunciation of worldly goods and the world as such, and he must feel the spirit of the saint. Even the devil in the image of a pig quietly froze beside Antony, like a domesticated dog. 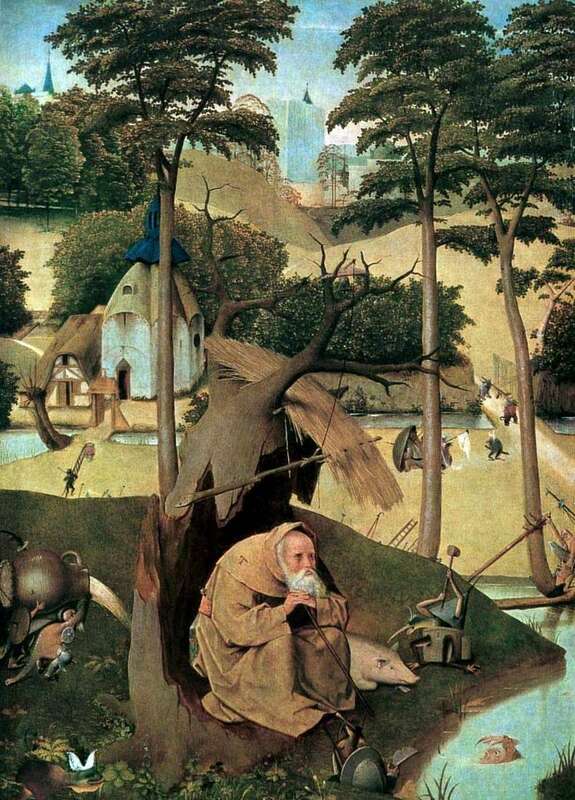 So he sees or does not see the saint in Bosch’s picture of the monsters that surround him? If you believe Ryusbruk, then no: they are visible only to us, sinners, because “what we contemplate is what we are.” As in the boards depicting St. Jerome, the devilry surrounding St. Anthony does not seem terrible: devils are reduced to toy sizes and no one not only attacks the hermit, but also does not pay attention to him, except for the grimacing monster in the water. The picture “Saint Anthony” or otherwise “Temptation of St. Anthony” scientists compare with the famous engraving of Durer “Melancholy I”. It is noteworthy that the word “melancholy” was then understood as a tendency not only to sorrow, but also to reflections. But an integral part of reflection is doubt, including doubts in perpetual truths, and this is vicious. In Bosch, the image of the inner conflict of a person reflecting on the nature of Evil, about the best and the worst, about the desired and forbidden, resulted in a very accurate picture of vice. Anthony, by his strength, which he receives by the grace of God, resists the squall of evil visions, but can the ordinary mortal resist all this? Description and meaning of the painting Saint Anthony by Hieronymus Bosch.